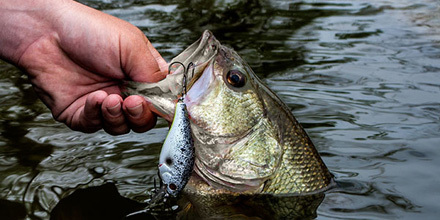 How Social Media Marketing is Like Bass Fishing (Part 2) – Kent Huffman: Marketing. Branding. Strategy. Tactics. Results. After Sammy and I parted ways, I couldn’t help but think that fishing and social media marketing have a lot in common. Moments after the next cast, the rod tip dove straight downward, almost touching the water’s surface. This was no bluegill, that’s for sure! Sammy jerked his rod with just the right tension to set the hook and began reeling. After the fish passed under the boat a couple of times, Sammy brought it to the surface, and wow! This was a nice largemouth bass, at least four or five pounds! That little voice in my head was no longer mouthing off about luck. This guy knew what he was doing. No sooner had the bass been placed in the boat’s livewell than I watched Sammy’s lure hit the water again. This time, the rod tip actually did touch the water when it bent down, as the strike was fierce. Within a few seconds, Sammy had the monster bass on his scales. Almost nine pounds! He turned and asked if I would take a picture with his cell phone, and I was more than happy to oblige. After Sammy and I parted ways, I couldn’t help but think that fishing and social media marketing have a lot in common. Sammy was experienced. He was disciplined. He was certainly patient. He was prepared. He knew what bait to use. He had the right gear—tools if you may. And he obviously knew where the fish were. Those are some of the same traits that a good marketer needs to succeed in the social media world. The mandates in my book—used consistently with discipline and patience—will, without question, elevate your social media marketing skills. And as a result, you’ll catch a lot more fish… oops, make that customers.